Is Studio 13 still not compatible with storyline. I have not tried it for a while as it was such a dilemma importing engage 13 the last time I did it. 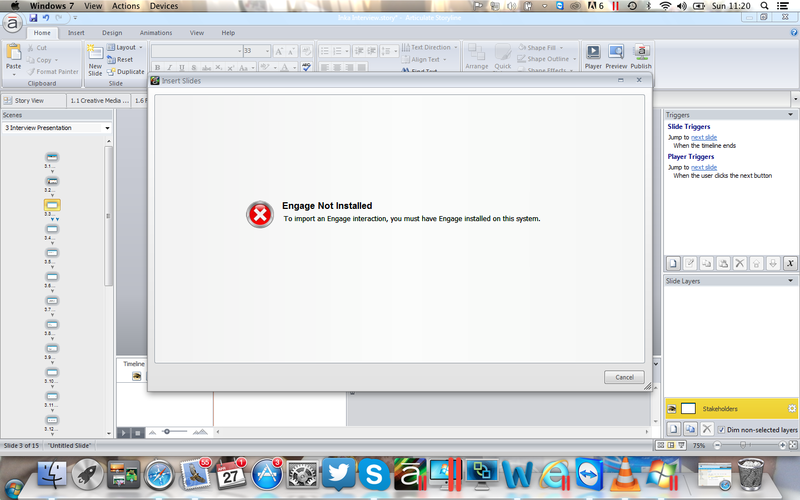 You used to be able to import engage 09 very easily into storyline, I have just tried to import an engage interaction into storyline and got this message although I definitely have it installed on my system, how else would I have created it! Is it referring to engage 09 not being installed? Hi Inka - As far as I'm aware, we're still not able to import Engage '13 into Storyline; however, I know that this was being worked on, and the thread below indicates that it would be a free update. Thanks for posting! What a shame I thought it would have been sorted by now. If you have Engage 13 installed on your machine, it would have removed all components as Engage 09. You'll need to uninstall Engage 13 and then reinstall Engage 09 to import the latter into Storyline, as you'll need an active version of Engage 09 to import into Storyline. As Ashley pointed you to, our team is still working on this update which would allow Studio '13 to be imported into Storyline.